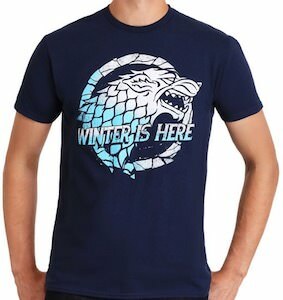 Visit our Game of Thrones Store with fun merchandise for you! Game of Thrones fans can now watch the series while the door keeps in place all thanks to this Hodor Door Stop. The door stop is made from wood and even comes in different wood kinds to make it look better with your own door at home. 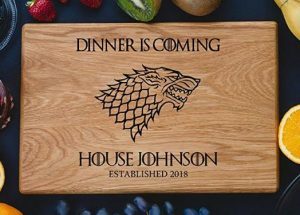 The Game of Thrones door stop is a wooden wedge that you can slide under the door to keep the door perfectly in place without having to worry that it slams shut by the wind or something else. On the top of the wooden stopper is says “Hodor” just like we have heard him say pretty often as it was the only thing he could say. Now it will be easy to keep your doors open or closed all thanks to Hodor. 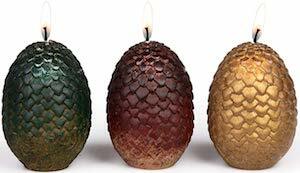 Winter is here but you can have light thanks to thees Dragon Eggs Candles. 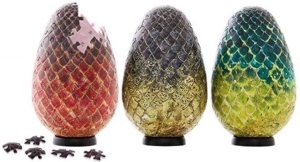 Game of Thrones fans know that winter is here and that also means more darkness and that means that you can really use some candles and this is a set of 3 candles and yes they do look like the famous dragon eggs. Each candle is 2.36 x 3.35 inches and they come in a set of 3 because we want 3 dragons. And as dragons can breath fire having candles that looks like dragon eggs is really fun as they now already have fire even before the dragon got born. The White Walkers follow their king to any battle, yes we are talking about the Night King who rules them all in the amazing television series of the Game of Thrones. 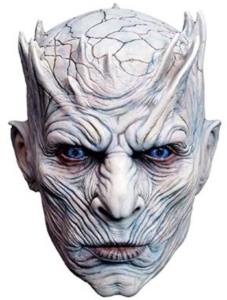 Now you can look exactly like the Night King with this very good replica mask that has all the scary features to make this mask a hit for Halloween or dress up parties that all Game of Thrones fans will love. This mask has a lot of fine details including the unmistakable ice blue eyes, pointed ears and bumps on the head. Made to be durable and last a long time with nose and mouth holes to easily breathe and have ventilation. 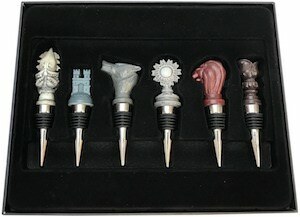 If Game of Thrones is on your mind then you should check out these Shhh! I’m Watching Game of Thrones Socks. 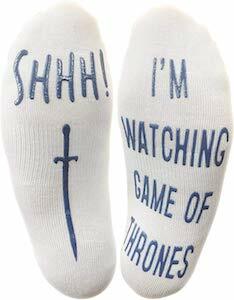 These white ankle socks are great for men and women that love to watch Game of Thrones. 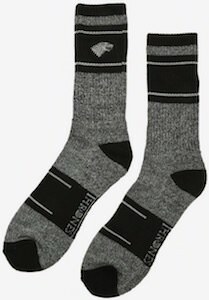 On the bottom of the socks it says “Shhh! I’m Watching Game of Thrones” and as it says that on the bottom it will show up perfectly as you are watching TV with your feet on the table. And as the text is on the bottom they are also are nonslip as the letters prevent you from slipping and sliding on a slippery floor.